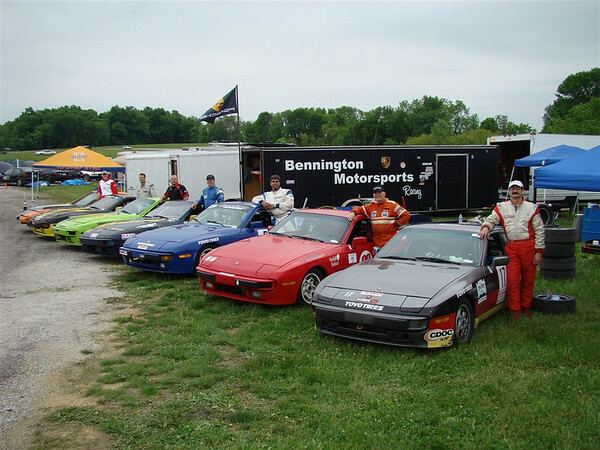 944 Spec crew at Putnam in front of series sponsor Bennington Motorsports Trailer. One happy gang! Some great racing action. No 944's were harmed in the making of these pictures, despite the close racing! The final race weekend of the NorCal season took place at Infineon Raceway on the cool fall weekend of November 6 & 7. Attendance was light with rain in the forecast and an unfriendly run group situation (all closed wheel race cars in one group). Jerry, Rick, and I were the only racers fearless enough to show. The battle for the championship would come down to these two races for Rick and me. I had to win both and Rick had to finish 2nd or better. I hadn't been racing in about two years when I pulled in. New faces and old friends smiled in greeting, back at the scene where I had met a spinning competitor in an unwelcome way. Racing is one of those silly things that people do because they can, because they're competitive, because they want to measure themselves against a clock, against their vehicle, against yourself, against other people. Racing is something that it would seem that we never need to do, a measurement that isn't actually necessary. And yet, that measurement is everything we live for, be it on a track, at the office, at poolside: Can I make myself better while enjoying the most out of life? 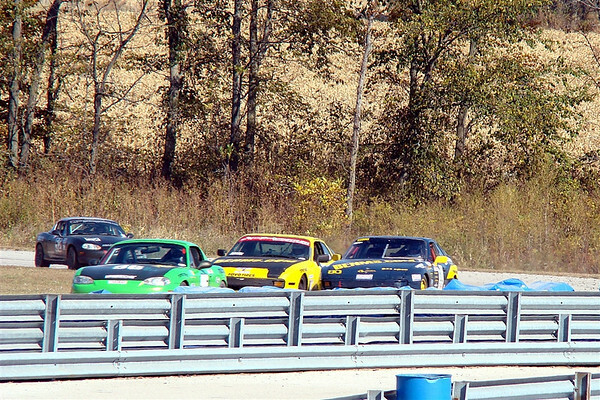 October 9 & 10 have been circled on my racing calendar all year because that's when we hold our annual "Porsches at the Point" event at Infineon Raceway(Sears Point) which is put on by the Porsche Racing Club or PRC in conjunction with NASA. Masuo Robinson and the people of the PRC always put on a great event but it's made even better by the hard work of Ken Huey and the generosity of Art at Autopoint Motors who donate cash prizes for 944 drivers. On a nice warm Arizona morning at Firebird West, the stage was set for another exciting 944 spec race. F.I.R. West is a tight course with limited passing zones. Getting a good start and getting through the first set of turns clean was everyone’s game plan. We had two spec Miata’s joining in on the fun and mayhem.